Royal Holloway University of London, Biological Sciences, 4 West Heath Drive, London NW11 7QH U.K. The biodiversity potential of green roofs in London and their potential role in invertebrate conservation and habitat mitigation were studied. In summer and autumn 2004, I investigated three different habitat types: green (Sedum) roofs, brown/biodiverse roofs, and brownfields. The study focused on three diverse invertebrate groups: Araneae (spiders), Coleoptera (beetles), and aculeate Hymenoptera (wasps, ants, bees). A high abundance of invertebrates were found on the roofs. At least 10% of species collected at the study sites were designated nationally rare or scarce, in accordance with criteria established by the intergovernmental agency Natural England. The data indicates that green and brown/biodiverse roofs can be important tools for invertebrate conservation. Even our most industrial, built-up cities need not be completely devoid of green space and wildlife. While parks and gardens come to mind as obvious refuges for nature, plants and animals are often more adventurous with regard to the places they colonize and use. Not many people associate rooftops with wildlife habitats, but if suitable niches are available or provided, plants and animals will rapidly move in and establish communities. In some cases, green roofs offer the only valuable wildlife sanctuaries in our cities and towns. Of particular importance is the fact that these rooftops already exist, so no additional space has to be sacrificed. The potential to provide habitat for wildlife on green roofs is tremendous. In London, for instance, 26,000 hectares of available roof space could be greened with little effort, and this would create 28 times the green space of Great Richmond Park (Grant, Engleback & Nicholson, 2003). Figure 1: Retail Sedum Roof, Canary Wharf, London. The term "green roof" describes both intensive, ornamental roof gardens and extensive roofs with more naturalistic plantings or self-established vegetation. Intensive green roofs are like parks and gardens at roof level and require deep soil and regular maintenance. Extensive roofs have more naturalistic plantings and shallower natural substrates and are either sown with (local) wildflower mixes or Sedum matting or left to colonize naturally. Extensive green roofs require little or no maintenance and are relatively inexpensive to establish. Brownfield sites include some of the most species-diverse habitats left in the U.K. They are sometimes referred to as "English rainforests" ("A Bleak Corner of Essex," 2003), because some of them harbor the same number of rare invertebrates that can be found in ancient woodlands (Gibson, 1998). The best sites may contain up to half of an entire county's invertebrate fauna (Gibson, 1998; www.buglife.org.uk). With the intensification of modern farming methods in rural areas, these sites, which have largely escaped improvement, have become wildlife refugia—habitat "islands" in a "sea" of industrial agriculture (Angold et al., 2006; www.buglife.org.uk). So what is the problem? There is increasing pressure to redevelop the brownfield sites. In London, for example, according to the latest estimates, 24,000 new homes are expected to be built each year (DETR, 2000). The general government strategy is to build 60% of these homes on brownfield sites (DEFRA, 2003). Huge swathes of industrial brownfield along the Thames estuary are slated for redevelopment, and this will have an immense impact on wildlife. Figure 2: Laban Dance Centre (brown/biodiverse) roof. To offer suitable habitat replacement for the community of invertebrates associated with brownfield sites, we need to understand the ecology behind these habitats, along with the ecology of green roofs. This will help us design green roofs to maximize their biodiversity potential. 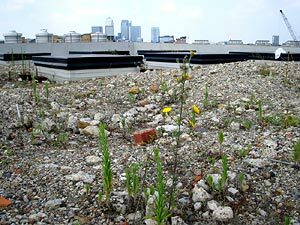 The aim of this paper is to document some of the invertebrate diversity associated with green roofs in London, as a first step to understanding their ecology. In summer and autumn 2004, I sampled and quantified the fauna and flora of nine sites, including three Sedum green roofs ("FC4," "Retail," and "Waitrose," located in Canary Wharf; Figure 1), two recently constructed brown/biodiverse roofs ("Laban Dance Centre" and "Creekside Education Centre"; Figure 2), and four brownfield habitats ("Wood Wharf" in Canary Wharf; "Sentinal" and "BR," near the Laban Dance Centre; and "Creek Ground," adjacent to the Creekside Education Centre; Figure 3) in the London area. Our study sites were chosen to encompass a good representation of green roof, brown roof, and brownfield habitat. The roofs were covered with different substrate types such as aggregate, Sedum matting, and other vegetation, so that the influence of substrate on community development could be investigated. Table 1 lists the ages and areas of the roof and brownfield sites. As previously mentioned, green roofs are not common in the U.K., so it is difficult to find suitable study sites. Moreover, as the general construction practice to date has incorporated green roofing based on Sedum matting, the availability of green or brown roofs based on aggregate is limited. Figure 3: Sentinal, flood defence wall (brownfield site), Deptford, London. The research focused on sampling the invertebrate population of the study sites. It targeted certain groups of importance to the U.K. Biodiversity Action Plan and English Nature's Species Recovery Programme (www.english-nature.org.uk) notably, Araneae (spiders), Coleoptera (beetles), and aculeate Hymenoptera (wasps, ants, and bees, excluding sawflies and parasitic wasps). These groups were identified to species level: Spiders were identified by the author and checked by Peter Harvey; hymenopterans were identified by Peter Harvey; and beetles were identified by Richard Jones. The presence and abundance of other incidental invertebrates were also recorded. Pitfall trapping was the primary sampling technique. At each sampling site, 10 pitfall traps (125 ml, 85 × 60 mm polystyrene cups) were buried in the substrate, with their rims flush with the surface. The traps were filled with a solution of 33% antifreeze and 67% water. Every three weeks from May through October, the traps were emptied and refilled. The contents of each pitfall trap were collected in a single separated container. Results indicated a high abundance of invertebrates on the roofs. In some cases, the total number of individuals was higher on roofs than at our brownfield sites (Figure 4). This was surprising, considering that the brownfield sites are very species rich. It should be noted that the brown roofs surveyed in this research were created just one year prior to sampling. Consequently, these sites were in the early stages of succession but are expected to increase in invertebrate abundance over time. 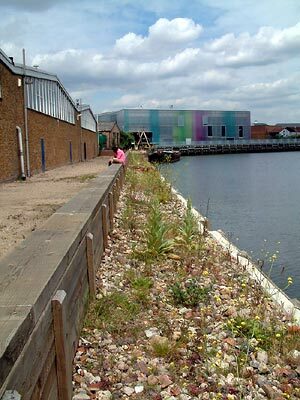 On the Sedum green roofs, the total number of invertebrates collected was in fact higher than on the brownfield sites. However, the data was somewhat distorted by the high numbers of snails: At least half the invertebrates collected on the Sedum roofs were snails. The presence of snails in such high numbers was somewhat puzzling but may be best explained by the lack of mammalian predation. Moreover, snails are commonplace at green roof farms, so they were most likely brought in on the original Sedum matting and persisted over the years. I decided to include snails in the analysis since they do provide a valuable food source for birds. Figure 4: Total number of invertebrates collected at each study site in 2004. Figure 5 shows the mean number of invertebrates collected in each trap at one collection. This table mimics the results of Figure 4; however, it presents a more accurate picture because individual traps can be lost or taken by birds. The species diversity index was calculated for all sites (see Figure 6). The data indicated that the brownfield sites were more species rich than the Sedum green roofs and the sampled brown roofs. As mentioned earlier, however, the brown roofs were only a year old, and this probably explains the somewhat low species diversity. (Indeed, my results for 2005 and 2006 do indicate that biodiverse roofs become more species rich over time [Kadas, 2002]). The high abundance of invertebrates is, in and of itself, of great interest. Furthermore, at least 10% of our collected species from the target groups are in fact considered nationally rare and scarce, as defined by the intergovernmental agency Natural England (Figure 7; Table 2). The data shows that all of the sampled Sedum green roofs and even the newly created brown roofs house spider species listed as nationally rare and scarce (Figure 8). Most of our green roofs—but most importantly, both of the new brown roofs—accommodate beetle species of national importance (Figure 9). This data implies that if suitable habitat is created on green or brown roofs, it could provide an essential tool for species conservation. Figure 5: The mean number of invertebrates collected in each trap (2004). The main aim behind this project was to determine the biodiversity potential of green roofs. What can they offer? How can they be used for habitat creation in the "urban jungle"? The results are most surprising. Even the relatively few Sedum green roofs present in London provide effective habitat for a large number and diversity of invertebrates. Furthermore, the newly created substrate-based brown/biodiverse roofs at Laban and Creekside are highly species rich. It will take some time before these roofs are fully colonized by flora and fauna, but the early results indicate that their potential is enormous. This research compares green roofs with well-established urban brownfield sites. It would be interesting to compare green roofs with greenfield sites (semirural agricultural land). Research shows that most brownfield sites are more species diverse than greenfield sites (Gibson, 1998; www.buglife.org.uk). The planting of monocultures and the use of intensive management systems in greenfields tend to lower their species diversity. It is possible, therefore, that green roofs could support more species on the whole and have higher species diversity than these semirural sites. Figure 6: Shannon-Weiner species diversity index of invertebrates in 2004. 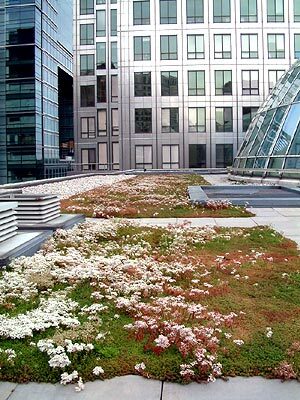 In addition to providing valuable habitat for wildlife in general, green roofs can host a number of species of interest that are rare or scarce in other habitats. Many of the species collected in this study are in fact highly localized and have a low or limited range of distribution. Consequently, the establishment of green roofs may provide additional resources for these species—and in some cases, the only habitat in which they can survive. My project focuses on spiders, beetles, and aculeate Hymenoptera. The results show that at least 10% of all species recorded are in fact faunistically interesting. All are either RDB (Red Data Book) species, nationally rare or scarce, or have limited range of distribution (Figure 7). Consequently any additional habitat provided for these species—such as green roofs—is vital for their long-term survival. My results suggest that meaningful habitats can be created and managed in urban areas. Figure 7: Total number of taxonomic arachnid (Araneae), aculeate Hymenoptera, Coleoptera, and notable species in the sample (2004). Spiders were chosen as one of the main focus groups in this project not only because several spider species are threatened in the East Thames Gateway but also because spiders occupy the mid-trophic level of the food chain, and thus they give a good indicator of the abundance of species in the lower and higher trophic levels. Spiders display a wide variety of foraging strategies, which dictate requirements for vegetation and soil structure (Gibson, Hambler & Brown, 1992). This invertebrate group is so diverse in terms of foraging and habitat requirements that spider abundance and species richness may be considered a good measure of the overall biodiversity potential of the sampled habitats. Seventy-two different species were collected from the study sites in 2004. This represents almost 12% of the total U.K. (Harvey, Nellist & Telfer, 2002) and 30% of the Greater London spider fauna (Milner, 1999). It is remarkable that such a high percentage of London's spider fauna has been found on these roofs—which represent a relatively small space—in a single year. Furthermore, five new species were recorded for Greater London: Pardosa agresits and P. arctosa (Lycosidea); Steatoda phalerata (Salticidae); and Silometopus reussi and Erigone aletris (Lyniphidae). The last of these species (E. aletris) has never been collected in southern England before. As noted already, the roof habitats are not only being colonized by ubiquitous invertebrate species but also by local, rare, and highly specialized species (Figure 8). In fact, we collected wetland spiders of national importance such as Arctosa leopardus and Pirata latitans (both from the Lycosidae). These species take advantage of the diverse surfaces of the roofs, such as the shadier sections—even those created by architectural features such as solar panels—and areas where rainwater is allowed to accumulate. This is further evidence of the tremendous potential these roofs have for biodiversity conservation. Figure 8: The proportion of species of importance in the 2004 sample for spiders. The majority of beetle species feed on vegetation or decaying organic matter, hence the number and identity of different beetle species gives an indication of the amount of resources that the habitat can provide. The results for beetles in my survey were very similar to those for spiders. Over 10% of the collected species found on the green and brown/biodiverse roofs had national or local conservation status (Figure 9). Some of the species found were very rare, such as Microlestes minutus, which has only been recorded six times in the U.K. Two of these records came from the newly created biodiverse roof in Canary Wharf. This finding suggests that if a suitable habitat is created, wildlife will soon colonize. The Sedum green roofs had extremely high populations of the ladybird Coccinella 7-punctata. Indeed, it might be said that roofs were almost infested with ladybirds and their larvae. The precise reason for this is not yet known. I can only speculate that aphids are very numerous on these roofs, which are insecticide free, and that the ladybirds are taking advantage of the profusion of aphids. Another ladybird, Hippodamia variegata, was also found in relatively high numbers on the brown/biodiverse roofs, and this is noteworthy because of the species' status as nationally scarce. Figure 9: The proportion of species of importance in the 2004 sample for beetles. While this study attempted to focus on aculeate Hymenoptera, the sampling technique used was not the most ideal to target this group. Pan trapping was used, but in many cases, the traps went missing. To sufficiently analyze the presence of this group, it would have been necessary to include visual surveys of the roofs. My results, however, do indicate that aculeate Hymenoptera species are present, and furthermore, that green and brown/biodiverse roofs give vital resources to many of our nationally rare and scarce species. Most of these species are highly localized and can only be found on brownfield sites. Therefore the presence of these species on the roofs is especially important. Since many brownfield sites are earmarked for redevelopment, green and brown roofs could provide the essential habitat needed for the survival of these species. It has to be added, however, that for successful conservation of target species, the roofs must be designed for their specific habitat requirements. While Sedum plants can provide vital pollen and nectar resources for hymenopterans, roofs composed entirely of Sedum matting only offer these resources for a limited time, namely the relatively short flowering period of the plants. It is essential to provide a wide range of native wildflowers in our roof habitats to prolong the resource availability for these species. It is also essential to provide nesting material for these species. I have recorded significantly higher numbers of Hymenoptera on biodiverse roofs when material such as old wood and sandbanks are provided. Green, biodiverse roofs could play an important role not only in creating additional wildlife spaces in urban areas but also in the conservation of rare or endangered species. This research shows that green roofs house a large swathe of invertebrates, at least 10% of which are nationally rare or scarce. Consequently, the potential for these artificial habitats is vast. First of all, I would like to thank Dusty Gedge, the "father" of this project, for his inspiration and enthusiasm, which never fails to inspire. Thanks also go to Dr. Alan Gange, my supervisor, Stephan Brenneisen, in Switzerland, and to my sponsors, Tony Partington at Canary Wharf, People's Trust for Endangered Species, British Waterways, Esmée Fairburn Trust, and London Development Agency. I would also like to thank Lorraine Fisher, Alec Butcher, Burnett Parsons, Alan Ashby, and Mike Shepherd at CWML; Chris Gitner at the Creekside Centre, Deptford; Paul Pearce-Kelly, Amanda Ferguson, and Kevin Frediani at ZSL; Reg Fitch at Laban Dance Centre; Peter Allnutt; Nick Ridout at Alumasc-Exteriors Ltd; and finally, Peter Harvey and Richard Jones for their entomological expertise. Angold, P.G., Sadler, J.P., Hill, M.O., Pullin, A., Rushton, S., Austin, K., Small, E., Wood, B., Wadsworth, R., Sanderson, R. & Thompson, K. (2006) Biodiversity in urban habitat patches. Science of the Total Environment, 360, 196–204. Brenneisen, S. (2003). The benefit of biodiversity from green roofs: key design consequences. In Proceedings of the First Annual Greening Rooftops for Sustainable Communities Conference, Awards and Trade Show (Chicago, 2003). Toronto: Green Roofs for Healthy Cities. Brenneisen, S. (2004) From biodiversity strategies to agricultural productivity. In Proceedings of the Second Annual Greening Rooftops for Sustainable Communities Conference, Awards and Trade Show (Portland, OR, 2004). Toronto: Green Roofs for Healthy Cities. Bristowe, W.S. (1958). The world of spiders. London: Collins. DETR (Department of the Environment, Transport, and the Regions). (2000). Our towns and cities: the future—delivering an urban renaissance (pp. 138–140). Colegate, Norwich: Her Majesty's Stationary Office. DEFRA (Department for Environment, Food and Rural Affairs). (2003). Achieving a better quality of life. In Review of progress of sustainable development (pp. 20). Government Annual Report, 2002. London: DEFRA Publications. Getter, K. & Rowe, B. (2006). The role of extensive green roofs in sustainable development. HortScience, 41(5), 1276–1285. Gibson, C.W.D., Hambler, C. & Brown, V. (1992). Changes in spider assemblages in relation to succession and grazing management. Journal of Applied Ecology, 29, 132–142. Gibson C.W.D. (1998). Brownfield: red data. The values artificial habitats have for uncommon invertebrates. English Nature Research Report No. 273. Peterborough, U.K.: English Nature. Greater London Authority (2002). Connecting with London's nature: The mayor's draft biodiversity strategy. London: Greater London Authority. Grant, G., Engleback, L. & Nicholson, B. (2003). Green roofs: existing status and potential for conserving biodiversity in urban areas. English Nature Research Report No. 498. Peterborough, U.K.: English Nature. Harvey, P., Nellist, D. & Telfer, M. (2002). Provisional atlas of British spiders: Volumes 1–2. Huntingdon: Biological Records Centre. Kadas, G. (2002). Study of invertebrates on green roofs: How roof design can maximize biodiversity in an urban environment. Unpublished mater's thesis, University College, London, England. London Biodiversity Partnership (LBP). (2001). The London biodiversity action plan: Volume 2. London: LBP. Milner, E. (1999). Spider records for London and Middlesex in 1998, damage to an important spider habitat, and revised species list. The London Naturalist, 78, 135–145. Vidal, J. (2003, May 3). A bleak corner of Essex is being hailed as England's rainforest. The Guardian. Retrieved from http://education.guardian.co.uk/higher/sciences/story/0,,949777,00.html. Table 1. Age, elevation, and area of the green and brown/biodiverse roofs in the study, and the age and area of the sample brownfield sites. Table 2. Invertebrate species list for all samples (2004). Chrysomelidae, Leaf and flea beetles	 Chaetocnema concinna Marsh. Forficulidae, Earwigs	 Forficula auricularia L.
ACULEATE HYMENOPTERA—Bees, wasps, and ants: insects with marked "waist" (defined region between the thorax (chest-plate) and the abdomen (belly)). HEMIPTERA—Land bugs: These insects have a beak or rostrum for sucking plant or animal juices. Their forewings, when present, are horny with a membranous tip. DIPTERA—True flies: insects with only one pair of wings, the hind pair of wings reduced to pin-shaped halters. ORTHOPTERA—Crickets and grasshoppers: stout-bodied insects with an enlarged saddle-shaped pronotum (first chest-segment). Their hind leg is usually long, modified for jumping.